BGL Basics: How Do I Create a Camp Map? To create your camp map, click on the button as seen below. This will take you to your map. If you had entered a location for your camp it will have zoomed to that location. 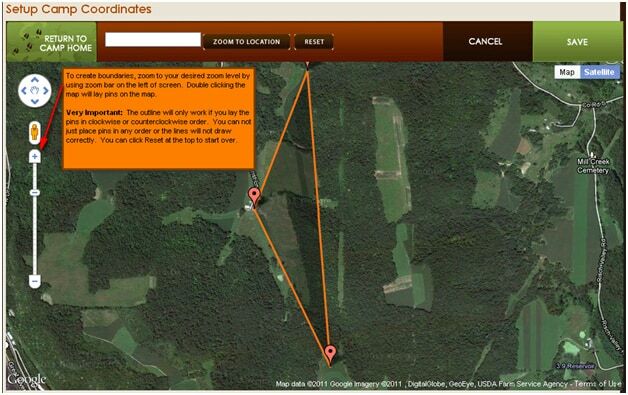 Find your hunting area on the map and zoom to your desired level using the zoom bar on the left. If you double click to zoom, you will drop a pin point in an undesired location. If this happens, hit reset and start over. Once you are ready to create your camp boundary, double click to lay your first point. Click pin points in a clockwise or counterclockwise rotation. If you don’t do not follow this pattern then the camp boundaries will crisscross. You can doubleclick a pin point to remove it, if you put one in the wrong location. You can also click reset and start over. See screen shots and narratives for reference. 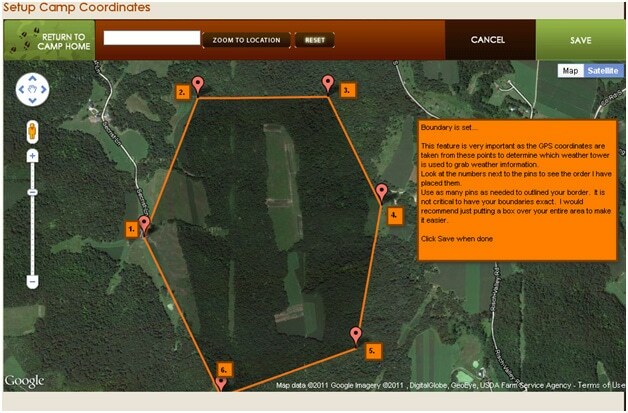 Camp boundaries are important as these GPS coordinates are the center for your weather data. Once finished, click save and you will return to the camp homepage. NOTE: Please create one camp for each hunting ground that you wish to manage. Do Not manage multiple lands on one camp as the weather data will only choose one GPS coordinate to pull from and your data will be skewed. Creating camps is very simple and is not time consuming. This way you can also manage the members of each area.